Students, faculty, and staff are all on the go. In today’s mobile world it only makes sense that teaching and learning are no longer confined to the campus anymore. 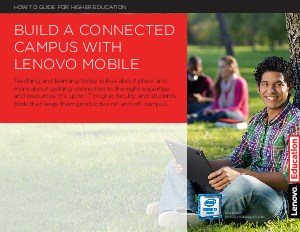 But to maximize the benefits of a mobile, connected campus, you need a solid planand infrastructure. Ultrabook, Celeron, Celeron Inside, Core Inside, Intel, Intel Logo, Intel Atom, Intel Atom Inside, Intel Core, Intel Inside, Intel Inside Logo, Intel vPro, Pentium, Pentium Inside, vPro Inside, Xeon, and Xeon Inside are trademarks of Intel Corporation in the U.S. and/or other countries. All other trademarks are the property of their respective owners. Lenovo (HKSE: 992) (ADR: LNVGY) is a $46 billion global Fortune 500 company and a leader in providing innovative consumer, commercial and enterprise technology. Our portfolio of high-quality, secure products and services covers PCs (including the legendary Think and multimode Yoga brands), workstations, servers, storage, smart TVs and a family of mobile products like smartphones (including the Motorola brand), tablets and apps. Join us on LinkedIn, follow us on Facebook or Twitter or visit us at Solutions.Lenovo.com.